Montreal, Quebec, Canada, January 15, 2019 – MONARQUES GOLD CORPORATION (“Monarques” or the “Corporation”) (TSXV: MQR) (OTCMKTS: MRQRF) (FRANKFURT: MR7) is pleased to report additional positive assay results from the 2018 diamond drill program at its wholly owned Croinor Gold project 50 kilometres east of Val-d’Or, Québec. The initial 20,000-metre program started in March 2018 and focused on the expansion and infilling of the Croinor Gold deposit. The program was completed in early September with a total of 19,935 metres of core drilled in 89 holes. 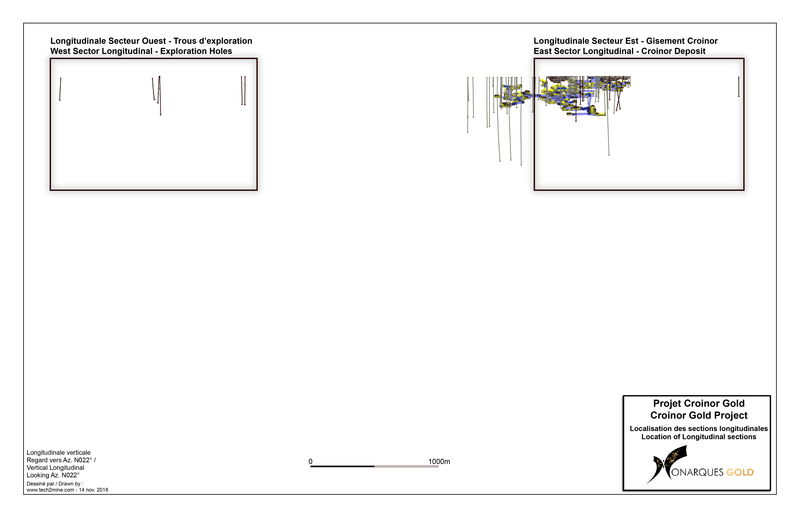 This last phase of the initial program shows the results from a total of 3,514 metres of drilling in 13 holes (see longitudinals: figure 1, figure 2 and figure 3). 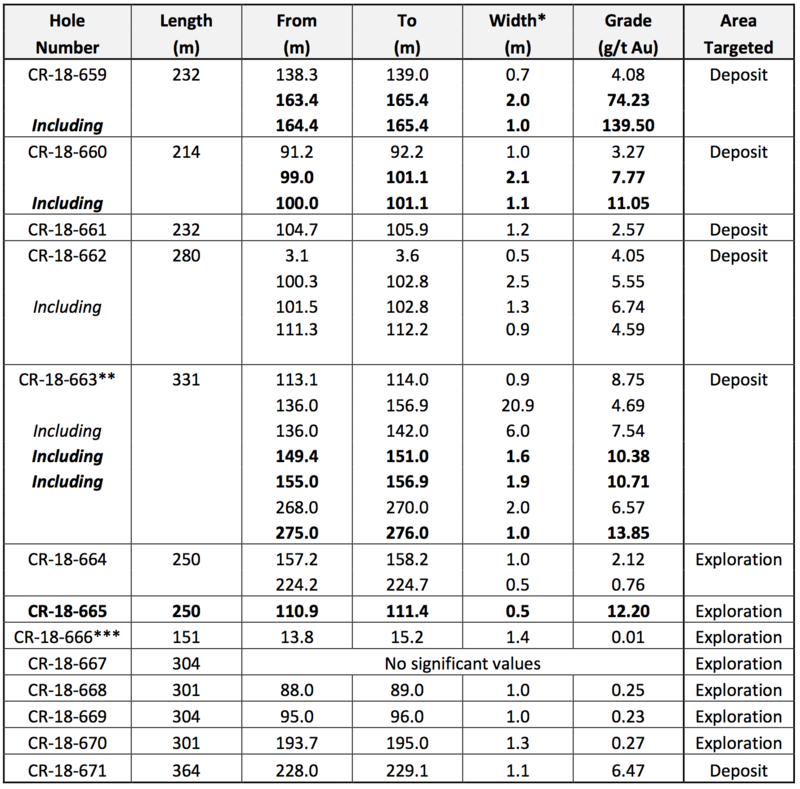 Assays have been received for all 89 holes (see table below and press releases dated July 10, 2018, September 5, 2018 and October 4, 2018, for a compilation of the drilling program results). The results obtained from the initial program warranted additional drilling on Croinor Gold. Drilling continued with one rig on the property and a second drill was added on September 17, allowing Monarques to drill an additional 6,645 metres before the winter freeze. The results of the additional drilling will be released soon. Hole CR-18-659 returned a very impressive 74.23 g/t Au over 2.0 metres, including 139.50 g/t Au over 1.0 metre. This intersection is just below the historic 500-foot level drift, 150 metres below surface, and is 30 metres east and 30 metres down dip from two planned stopes, with no other holes between the stopes and this hole. This hole has the potential to connect the two stopes and could substantially increase the tonnage and grade of the resource at the 500-foot level. Like Hole CR-18-659, Hole CR-18-660 is also an infill hole drilled between two planned stopes that are 60 metres apart. Hole CR-18-660 returned values of 7.77 g/t Au over 2.1 metres, including 11.05 g/t Au over 1.1 metres. This hole also connects the two stopes, increasing the grade and tonnage in this part of the mine. This intersection is 80 metres below the surface and is just below the 250-foot level of the old workings. Hole CR-18-662 was drilled between four planned stopes and returned values of 5.55 g/t Au over 2.5 metres, including 6.74 g/t Au over 1.3 metres just below the 250-foot level, 90 metres below surface. This hole could connect the four stopes together, again increasing the grade and tonnage in this area of the mine. Hole CR-18-663 was drilled in the eastern part of the deposit. This hole intersected two zones, the first on the 250-foot level and the second below the 500-foot level. The first zone returned 4.69 g/t Au over 20.9 metres, including 10.38 g/t Au over 1.6 metres and 10.71 g/t Au over 1.9 metres. 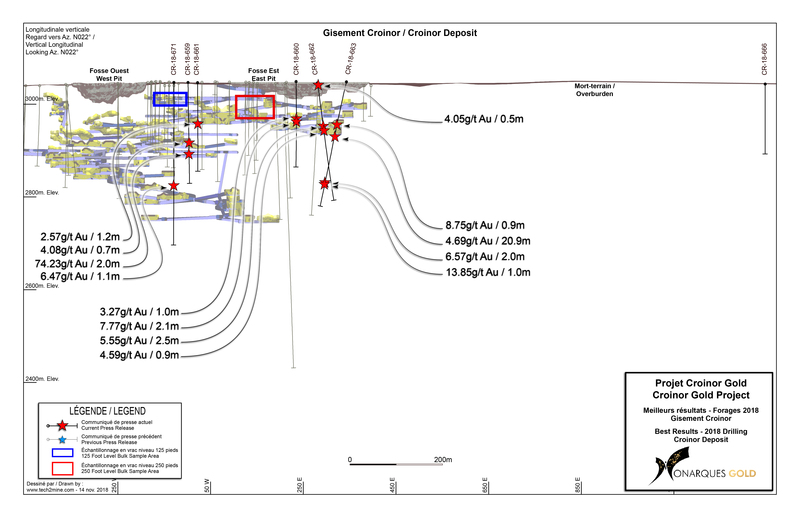 The hole was drilled east of the most easterly planned stope, thereby enlarging the width of the stope eastward by nearly 20 metres; most planned stopes at Croinor Gold are two metres wide. The second zone is below the historic workings, 215 metres below surface, and returned 13.85 g/t Au over 1.0 metre. This hole was drilled between two holes drilled in 2011: the hole to the west is 43 metres away and returned 3.26 g/t Au over 0.9 metre and the hole to the east is 75 metres away and returned 1.81 g/t Au over 1.0 metre. These values show that the deposit is still open to the east, to the west and at depth, and that this area merits further drilling. Holes CR-18-664 and CR-18-665 are exploration holes drilled approximately three kilometres to the west of the Croinor Gold deposit in volcanic rocks and another narrow diorite sill. Both holes encountered visible gold, but only Hole CR-18-665 showed significant values, returning 12.20 g/t Au over 0.5 metre. 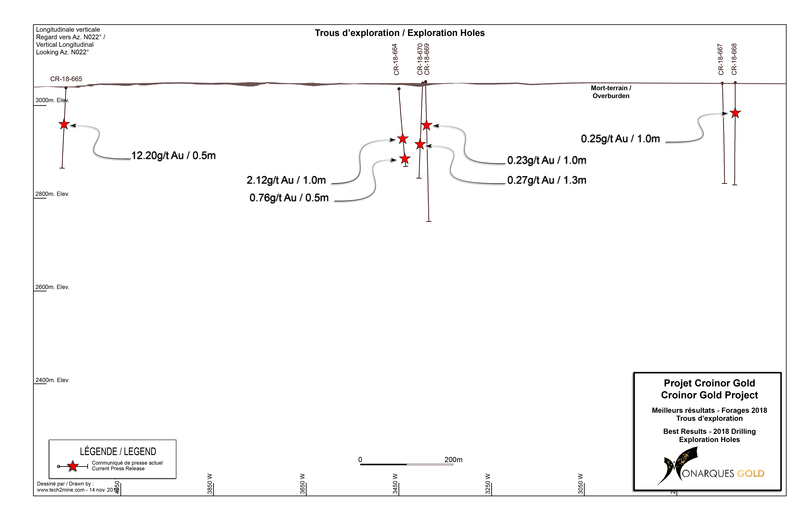 An intersection with visible gold in Hole CR-18-664 returned 0.76 g/t Au over half a metre. These are encouraging results for pure exploration holes in an area that has never been drilled. Follow-up drilling has been done between these holes and assays will be released soon. Holes CR-18-666 through CR-18-670 are exploration holes that were drilled to test induced polarization anomalies. *The width shown is the core length. True width is estimated to be 90-95% of the core length. **Hole CR-18-663 was drilled down dip, parallel to the diorite, to test for the presence of multiple directions of quartz veining. The width shown is the core length. True width is estimated to be 30-35% of the core length. ***Hole CR-18-666 is a vertical hole, to test the presence of an interpreted flat-lying vein. The width shown is the core length. True width is estimated to be 90-95% of the core length. The Croinor Gold deposit is hosted in a sheared diorite sill three kilometres long by 60-120 metres wide, striking 295 degrees north and dipping 50-65 degrees to the north. The mineralization is associated with pyrite found within and adjacent to quartz-tourmaline veins. Sampling normally consists of sawing the core into equal halves along its main axis and shipping one of the halves to the ALS Minerals laboratory in Val-d’Or, Quebec for assaying. The samples are crushed, pulverized and assayed by fire assay, with atomic absorption finish. Results exceeding 3.0 g/t Au are re-assayed using the gravity method, and samples containing visible gold grains are assayed using the metallic sieve method. Monarques uses a comprehensive QA/QC protocol, including the insertion of standards, blanks and duplicates.